Acme Markets, Inc. has achieved second position as a retail and dealership supermarket chain in Greater Philadelphia. They have their corporate office at Horsham, PA. They have become major supermarket chain dealing in vegetables and fruits in the region. Among other leading business centers of grocery, they even operate in Maryland, Pennsylvania, New Jersey etc. 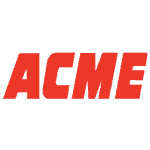 Acme Markets is categorized as a privately owned supermarket chain, incorporated and established in the region of Pennsylvania in 1891. Initially, the company was set up by Irish immigrants Robert Crawford and Samuel Robinson. There are innumerable stores under the supermarket grocery chain. They have also initiated customer service through online internet mode.